Following on from last week’s blog, that looked at fundamental business growth strategies, this blog expands on the improve productivity lever as a function of optimising your capacity utilization. It should be becoming clear by now that setting, and then managing towards, the right capacity utilization target(s) for your business is a critical management issue. The utilization topic can be obfuscated with multiple definitions and treatments; as such, you should aim for two principles when you discuss utilization within your business – simplicity and consistency. By simplicity, I mean that you deliberately limit both the language set used when discussing utilization and the number of time, or service, codes you actually track. By example, some companies refer to utilization to refer to all time spent working on useful projects (client and internal). In such semantic treatment, utilization covers all work time with the exception of being on the beach (or the equivalent phrase on the bench) – when a staff member is essentially awaiting tasking. With this treatment, billable utilization might then refer to the subset percentage of utilization that was spent working on client projects. Further, in such an instance, you will hear the term realization to refer to the subset of this time that was actually then billed to the client. This is all well and good – and allows for detailed time analysis – but I recommend you to a simpler approach in order that this topic is not just one for your finance controller but for every member of the firm. I recommend you use the term utilization to refer to time that is actually billable; in so doing, a simple, single communicated target will remain the right focus for everyone in your fee-earning team. You should keep it simple also in relation to the number of time, or service, codes tracked. It is possible to grow a successful business, in the early years, limiting this to a succinct set (e.g. Client-billable, Client-non-billable, Internal work, Holiday, Sick). This list deliberately excludes the On the Beach category as, within a small firm, you deserve shooting if a colleague is ever completely un-tasked i.e. anyone not on a client project should be instantly deployed to a constructive, internal initiative. 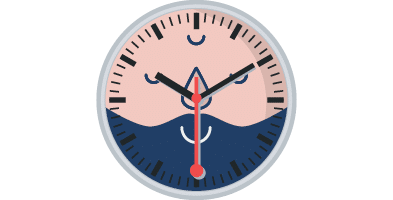 Of course, over time the granularity of this time allocation will be expected to grow (for example, to capture specific internal projects) but you should avoid over-complication here. There are many large firms who have over-engineered this time-tracking to a point where, whilst it is theoretically possible for them to analyse time across multiple dimensions, they have completely lost the buy-in of their staff (who are required to regularly input data in an ever- burgeoning time-tracking system) and a focus on the basics. Bearing in mind that, for professional service firms, capacity utilization is effectively a measure of time spent working (the numerator) over all the hours that it was possible to work (the denominator), what we have been discussing here is which numerator to track. The other muddy aspect of the utilization calculation concerns choosing an appropriate baseline to use for the denominator. Available time (post holidays and training) = Working time – Holidays – days allocated to training each year. I would personally steer you towards the latter treatment. If you want to develop a sustainable business then you should be deliberately factoring in an expectation that a certain amount of time each year is invested in the development of your team (training, internal communication events etc). You should also expect your staff to take their full holiday allowance – any alpha-male company that rewards those who don’t will ultimately pay for this perverse, myopic tactic with increased staff attrition and low levels of innovation and actual effective productivity. If you agree with these statements, then this recommended version signals this clearly to your colleagues. Further, it also makes sense for your 100% target to focus on what is actually set aside for billable time compared with constantly asking yourself what percentage of your theoretical denominator is the maximum practically possible. By way of example, say there are 260 working days in the year (noting this changes with the fall of weekends and whether a leap year) and 8 public holidays and that your company offers 25 days per year holiday allowance and expects everyone to undertake 10 days training. This leaves an Available Time denominator (post holidays and training) of 217 days (or 1,736 hours). Regardless of your choice – be consistent. It is futile having management conversations around utilization when multiple treatments are being used. Agree on one, communicate it loudly and stick to it. An effective way of keeping utilization at the centre of everyone’s attention is to include it in the staff bonus arrangements. Moorhouse’s system was to return 10% of all billable time (our definition of utilization) back to the individual as part of the six- monthly performance review (capped at their target utilization level so that we didn’t perversely incentivise anyone them to go over this). This proved to be a great way of keeping everyone aligned to the company’s objectives in this area. The bonus was also contingent on the money having been collected from the client – which gave another great incentive to those closest to the clients to support the business in chasing invoices through the client’s system. Similarly, during this six-monthly performance round, we would discuss utilization target and actuals achieved with each individual – it was a key feature on their one-page performance sheet (more of which in a future blog). 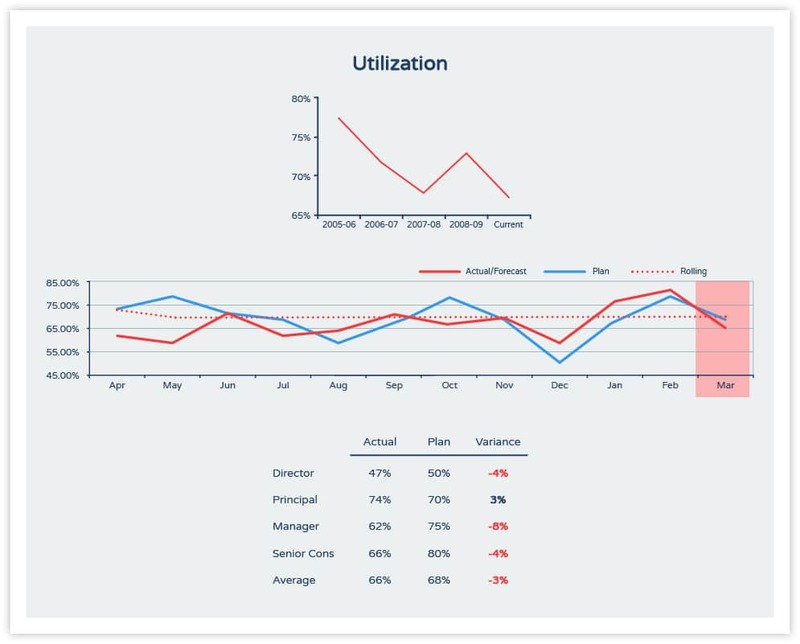 Measuring – and correcting – capacity utilization should also become a core tenet of your (typically monthly) financial reporting pack. Everyone in your client-facing team should be working to a plan (target) utilization (typically set by grade) and, each period (at least monthly) you should be comparing actual results to this profile. As your professional service business scales you will need to manage this aspect very closely. Of course, under utilized periods should focus the mind on your selling challenge (see my blog series on building a selling capability) but over utilization is equally concerning as this invariably means you will be in a feast-to-famine business development cycle and/or unlikely to be investing enough in your company build (intellectual property development, professional training etc.). Furthermore, in larger teams, it is critical not to lose sight of actual individual utilization levels as sustained over utilization is, inevitably, a precursor to burn-out; regular monitoring coupled with sound management practices can easily avoid this. By way of a mild caution, with these recent blogs, I may have given you an impression that all these management levers and profit improvement tactics are very mechanistic and distinct. The reality, of course, is that there is a huge amount of interconnectivity between them. You pull and improve one lever over here and another aspect may worsen. As you come to reinforce your understanding of the points raised in these recent blogs – and practice your ongoing management control of them – so you will get a better feel for these linkages. Next week, I will talk about the importance of knowledge management when scaling up a professional services business. Poorly understood by many – but massively important to get your head around (at a practical level) if you seek to build a firm of value!